Nairobi has awesome rooftop restaurants with great food, well- made cocktails, and Instagram-worthy views. Without any special listing here are our top seven. Located on the 10th floor of Four Points by Sheraton at Jomo Kenyatta International Airport, Tazama which is a Swahili word for 'Look' offers unobstructed views of Nairobi National Park from the pool deck and airport runway from the other. The restaurant is vibrant, very welcoming and serves locally inspired grills and hand crafted cocktails that truly capture the essence of Nairobi. 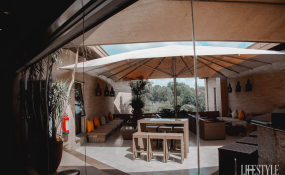 If you are ever at the restaurant, make sure you strike a pose in front of the Instagram-worthy graffiti wall and relax by the pool side with a glass of wine while you watch a herd of giraffes grazing. Tambourin is Nairobi's most luxurious rooftop restaurant located at Villa Rosa Kempinski in Westlands. The luxurious restaurant boasts a comfy Arabian themed lounge with intricate wall and floor designs that are tastefully finished to give guests an authentic Arabian experience. Here you can savour the very best culinary delights of Arabia with their Levantine menu focusing on flavors and recipes from Lebanon, Cyprus, Israel, Jordan, Palestine and Syria. Soak up the colour and vibrancy of Tambourin particularly in the evening as you watch the sunset and enjoy their Mezze platters while you sip on a cocktail after a busy day. Although Brew Bistro is popularly known as a night club, there is no need to go hungry as the rooftop bar has a vibrant menu that offers delicious burgers, tasty rooftop brunch and beautifully crafted signature cocktails. Brew Bistro offers the best of both worlds since you can enjoy a relaxing dinner and happy hour while listening to a live band and then turn up the volume after 10pm with the guest DJ. Since this is the perfect spot for a happy hour drink, beware that every other Nairobi-an in close proximity to Westlands probably had the same idea, so it's safer to reserve a table. This small, quiet, outdoor rooftop terrace is nested quite literally on the 3rd floor of Tribe Hotel in Gigiri area. The restaurant's Moroccan setting with large comfy chairs and oversized pillows offers a sophisticated but relaxed vibe. Nest is encased in greenery and overlooks the forest making it the perfect spot to enjoy sushi and signature martinis on a cool breezy evening. J's Karen is the home away from home rooftop restaurant you've been looking for. The restaurant's interior has a very stylish Afro-English blend and a laid-back atmosphere that makes it the perfect escape from the city crowd. Here, you can enjoy a fine lunch or dinner while you sip on specially crafted cocktails indoors or out while sitting around cozy couches and toasty fire pits. Judging from the name, you know this revolving restaurant offers fantastic 360-degree views of the city extending to the horizon in all directions. The menu focuses on Swiss cuisine and a variety of fondues and veal zurichoise. A window seat at this revolving restaurant will give you a view of Nairobi that changes while you chew and a chance to toast to the beauty of the city lights particularly in the night. Sarabi is perched on the rooftop of the luxurious Sankara hotel in Westlands. During the day, the guests can relax by the open-air pool deck and enjoy healthy juices and light revitalizing cuisine. If you are truly afraid of heights, don't look at the bottom of the pool. As the night falls, you will find the best views of the Nairobi skyline as you enjoy tapas-style shared plates, relaxing music from the live band and guest DJs.